I am starting this tea review with a shout out to David Campbell of Tillerman Tea. I haven't met David but I had heard good things about him and his company so I was pleased when he reached out to me to taste his teas. I accepted and began to drink them as soon as they arrived. However, I was not able to review them in a timely manner as other parts of my life crowded out this type of activity. 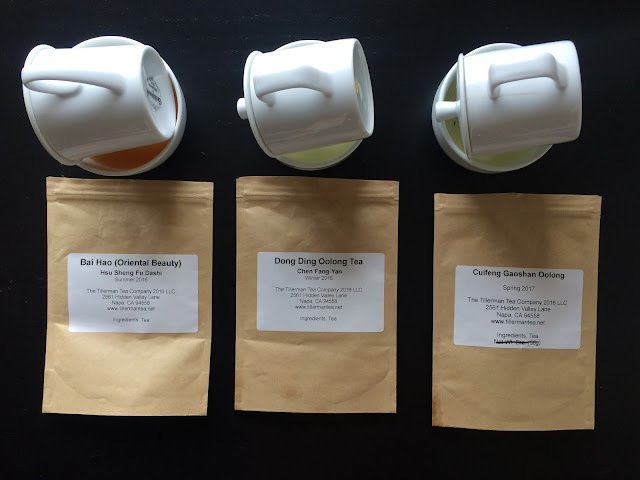 I was surprised then when David contacted me again with an offer of a second batch of oolongs. By including this story here I do not mean to imply that other tea companies are not similarly generous. If anything, it is a reminder to myself to be more generous with my acknowledgements of tea companies who make my passion for tea possible. 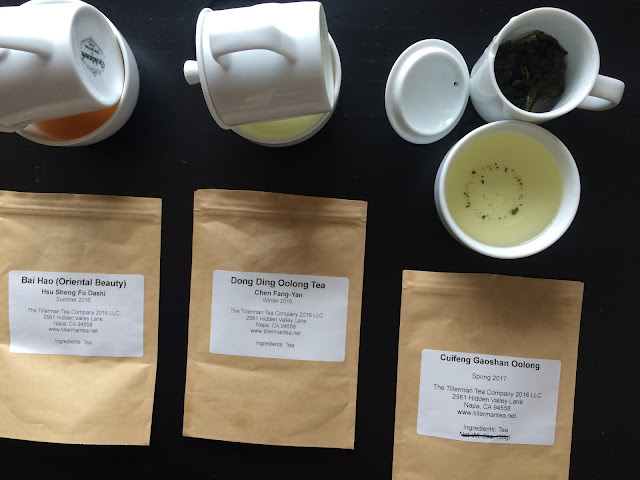 This review is about that first batch of oolongs: Oriental Beauty 2016, Dong Ding Winter 2016, and Cuifeng Gaoshan Spring 2017. It was easy to drink and assess the Oriental Beauty and even the Cuifeng which I don't think I had drunk before. The challenging tea for me was the Dong Ding. I've been drinking a Dong Ding or Tung Ting from a local vendor and Tillerman's version did not taste the same. The dry leaf was aromatic but this quality did not translate into the liquor. 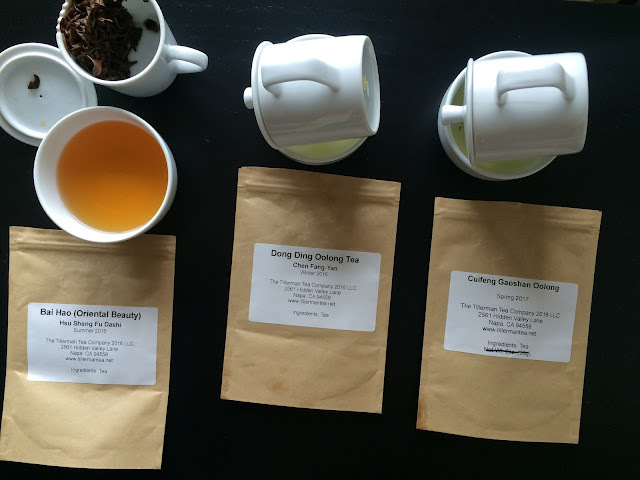 I thought I had mislabelled the teas during my tasting so I infused a new cup (albeit with less leaf) but the results were similar: a mild flavored liquor. One of the first questions I asked myself was: what is the quintessential flavor profile of a Dong Ding? Also, does this profile change with season? I also wondered about plucking style because when I thought I had mislabelled the Dong Ding and the Cuifeng, a quick confirmation would have been to study the leaves, but assuming oolongs are plucked with a bud and three leaves, that approach would not have been helpful, or would it? 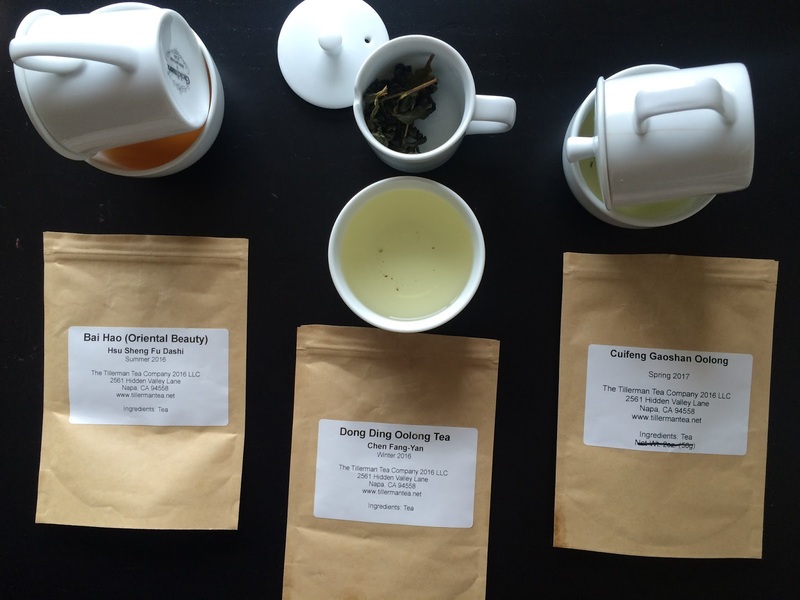 Does the bud and three leaves pluck apply to all oolongs? I think there were other questions but the three I've just mentioned were the most outstanding ones. I did not conduct extensive research but I consulted by go-to tea book titled Tea by Kevin Gascoyne et al., my ITEI lecture notes, and read around the internet. According to Gascoyne et al., the liquor of Dong Ding smells "powerful[ly]...of lilac, vanilla and clover honey" while its aroma is of "narcissus and peony...against a background of ripe peach and butter". These tasting notes were echoed on various websites even for winter harvest Dong Ding. I don't know how to explain my experience of this tea. Where the Dong Ding was mellow, the Cuifeng Gaoshan was intensely aromatic and flavorful. Tillerman's Cuifeng was harvested from Li Shan. This mountain range is the tallest tea mountain in Taiwan at 6,550 to 7,900 feet. I won't use Gascoyne et al. 's tasting notes here; instead, I will use mine. I prepared this tea twice. Once with 3 grams in preheated cups with 195F for 3 minutes and a second time with 2 grams keeping the other parameters the same. The lemon-green colored liquor was floral and savory where the dry leaves were creamy. The liquor was medium-bodied at a minimum with a creamy mouthfeel. Sweet and savory notes were present and pronounced on the middle of my palate. A lemon note emerged as the liquor cooled. My notes for the second session are quire similar. The liquor was floral and creamy though not as thick as the tea made with 3 grams. The flavors lingered in my mid-palate and in my cheeks with a citrus tail note. The depth of flavor increased as the liquor cooled. I don't need to note that this tea is a summer harvest, right? Oriental Beauty may not have have geographically protected status but it definitely can't be harvested outside of summer which is when the leafhoppers bite its leaves catalyzing the release of that desirably aromatic hormone. This OB has a medium presence of buds with leaves of fairly uniform size colored in various shades of brown. The dry leaves smelled of dried cherry and grape must and the infused leaves only got better with honey, herb, fruit, and warm spicy notes. The taste of the liquor was consistent with smell of the infused leaves. It was a complex, many-splendoured cup of tea. Tillerman's Oriental Beauty is such a classic where the term indicates a very good experience. Given the richness of the Cuifeng Gaoshan, this green oolong would be suitable for colder months as well as for warmer months. Too, you could prepare it hot with more leaf and iced or cold steeped with less leaf. 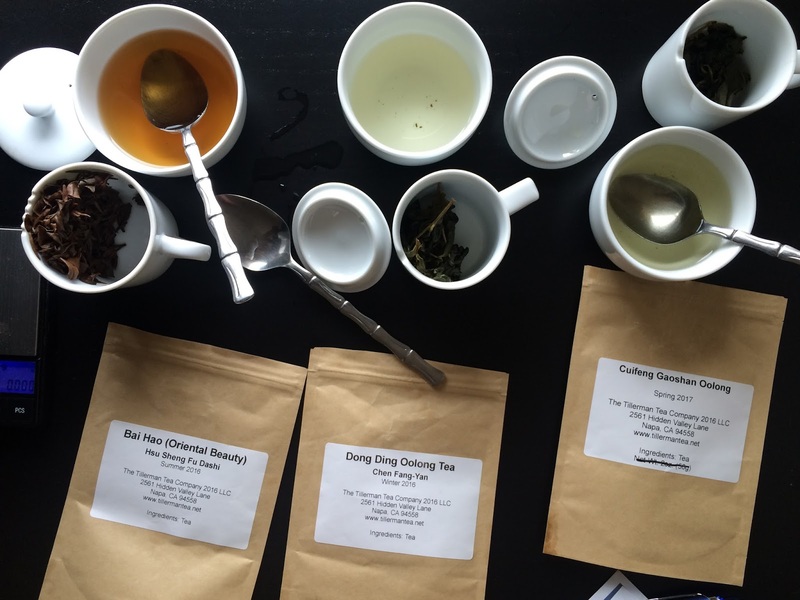 One of lessons I have learned from drinking tea is the individuality of one's palate so although I found the mild nature of the Dong Ding confounding, you might find it a palate pleaser. 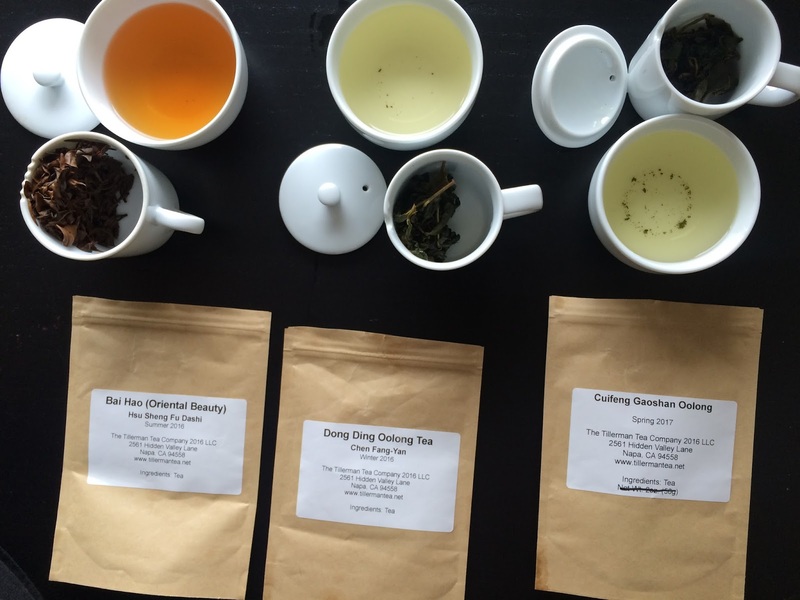 Thank you again to Tillerman Tea for the oolongs for review.